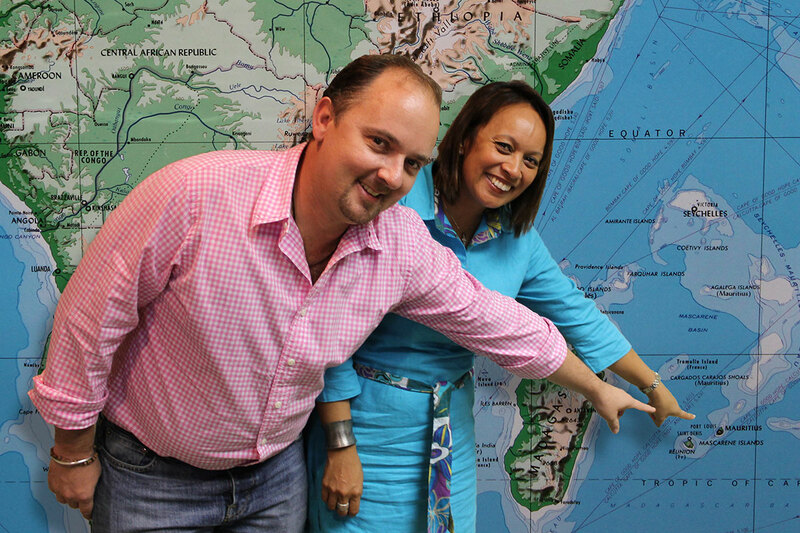 Sebastien and Genevieve Giraud point to their home of Mauritius on the map at the Pope Paul VI Institute. In the 30 short years since it was founded, the Pope Paul VI Institute has been building a culture of life that has extended well beyond the boundaries of its headquarters in Omaha, Nebraska. The Institute’s reach is reflected in many ways, but it’s perhaps most evident in the men and women who travel hundreds and thousands of miles to Omaha each year in order to receive the healing and hope that Pope Paul VI Institute so abundantly provides. Such was the case with Sebastien and Genevieve Giraud, residents of Mauritius, a tiny island in the Indian Ocean, situated just east of Madagascar, known most prominently as the former home of the now-extinct Dodo Bird. Suffering with infertility, the Girauds were being urged by local physicians towards methods that conflicted with their religious beliefs. Strong in their faith, they did what many Catholics would do: they conducted a Google search — seeking a patron saint for infertility — and were drawn to the story of St. Gianna Beretta Molla, the 20th Century Italian woman who demonstrated steadfast courage and faith in the face of a difficult pregnancy that would claim her life. After signing up for the St. Gianna Center’s online mailing list, the Girauds were soon contacted by a representative of the site who, aware of the couple’s infertility issues, mentioned the work being done through the Pope Paul VI Institute. Despite some initial skepticism, the Girauds visited the Institute’s website where they were captivated by the testimonials of former patients. “We thought ‘wow here is a place that heals the root causes of infertility’,” said Sebastien. “We knew then that we needed to contact the Pope Paul VI Institute.” After submitting bloodwork and a follow-up laparoscopy, Genevieve would be diagnosed with endometriosis, a painful condition that often results in infertility. Like many couples suffering with infertility, the Girauds were told repeatedly that in-vitro fertilization was their only option for pregnancy. The Pope Paul VI Institute offered a different option — using state-of-the-art robotic surgery, Dr. Hilgers successfully treated the conditions that caused her infertility (endometriosis, polycystic ovarian syndrome and blocked fallopian tubes). While the Girauds found healing at the Pope Paul VI Institute, it was faith that has left the most indelible impression on the couple.